Whether among the news pages or lifestyle features, each Oceania Cruises Guest can find bespoke editorial tailored to their precise requirements in TASTE magazine. 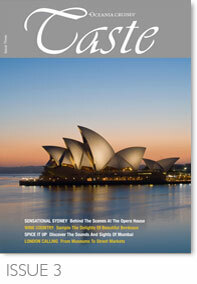 Distributed twice per year (May and November), TASTE magazine can be read in each stateroom and suite across the Oceania Cruises fleet. A leader in destination cruising and defining the upper-premium market, Oceania Cruises offers gourmet cuisine, gracious service and award-winning itineraries at an exceptional value.